Keeping your basement dry in spring is an important chore for homeowners. 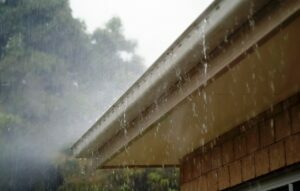 The function of rain gutters and downspouts is so that when water (rain or melting snow) hits your roof it flows down into the rain gutter and into the downspout. The downspout then carries the water away from the foundation of your house by 10 feet. In a perfect scenario the system works great and keeps water from the foundation of your home. Unfortunately at this time of the year when we have freezing and thawing cycles, the slush and water will fill up the rain gutter and downspout and freeze solid. Therefore when it rains, the water rolls down the roof and hits the rain gutter that’s frozen solid. This causes the water to flow right over the top and fall to the side of your house. This defeats the purpose of the whole system. As that water falls next to your foundation, it is seeping into the ground or pooling next to your foundation and basement walls. This can possibly lead to seepage into your basement or crawl space area. There really isn’t too much you can do to prevent snow and ice jams from clogging your gutters and downspouts. This is a season and temperature, weather related event. But you can keep an eye on your basement each day and take measures to minimize any damage. Regular daily inspections are important as not everyone goes into their basement on a daily basis. If you know that your basement or crawl space is prone to moisture issues or seepage during these times of the year, we recommend your personal belongings are moved up and out of the area that tends to be affected. Or, if you are doing a daily check and see that seepage is happening you can get on top of it by moving your items up and away. If you have furniture in the basement you can set your furniture up onto 2”x4”boards. This will give the water clearance to make it to the drain or to the sump pump without damaging your items. Another item to check on is your sump pump. Is it plugged in? Is it in good working order? Should it be replaced? You can test your sump pump by lifting the float and if it kicks on, it is working. However you should consider the age of your sump pump. It may work but if not in good working condition may fail when you need it most. If you sump pump is not working, we can give you an estimate to replace. There are corrective measures you can take if there’s a little bit of seepage. A dehumidifier in the bad area will help take the extra moisture out of the air and help dry the area. You can also use fans in the area to help keep the moisture drying out if the seepage is not coming in too fast. Otherwise you might have to make changes on the outside of the home. Putting plastic on the ground around your home up to 10 feet out will help lead the water away. When the water hits the plastic it runs out and away from the foundation. Also, make sure the ground around your home pitches away from your foundation. The biggest take away is to keep an eye on your basement to keep your basement dry in the spring. If you know of issues or find issues for the first time this year, take corrective measures to fix the issue. You will thank yourself time and time again. Remember, excess moisture, dark areas, and warmth promote mold growth. Keep the moisture at a low level and this will help keep mold from your basement or crawl space. If you see or smell mold, call us for a free mold assessment at 920.435.2288. If you need help with water removal from flooding or seepage, we can help you with that too. For more information on water cleanup, please visit our web page here.